If you live in an area where, despite how many layers you put on while inside, you still can’t seem to keep warm enough, then we have a beautiful selection of some of the best fleece jackets out there. They are versatile as can be worn outdoors too, and can be a good selection for those who are physically active as well. 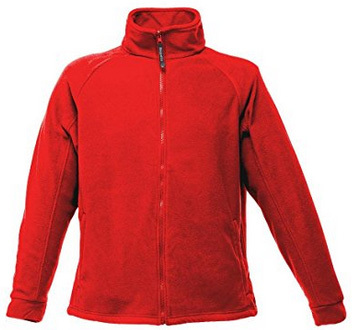 We have previously written about the features of fleece jackets and what sets them apart from other types of jackets. As a short summary, they are designed to provide plenty of warmth, while being especially good at maintaining it. All this, while also being highly breathable, therefore preventing overheating and sweating. They are not very suitable for damp conditions, but make great layering jackets, due to their breathability and insulation. Fleece jackets are typically made of 100% Polyester, although there are slight variations in some designs, mostly for the outer lining. We have selected fourteen fleece jackets for this review, seven for men and seven for women, so let’s take a look. 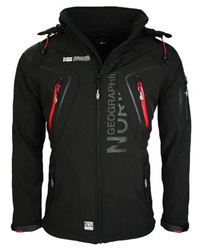 Ureka is the first jacket and it is by Geographical Norway. This is a normal fit jacket, lined on the inside with teddy fleece, which is a thick and soft lining that provides considerable warmth. It comes with two zippered pockets on the sides, both lined on the inside to quickly warm up the hands. On the inside there is a mesh pocket. The main zipper is concealed and the collar is medium-height and stand-up. On the inside, at the hem, there are adjusting drawstrings for a better fit and insulation. It comes in the colors: Camel, Black, Brown, Grey and Navy. 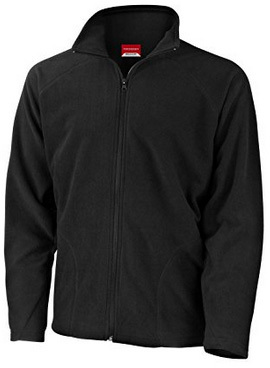 This next jacket is by Result and it is made of 200g/m2, anti-pilling micron fleece. That is an indication of quality fleece, as it will not cause any pilling, no matter how much it gets washed. It comes with two side pockets, lined on the inside, and a concealed main zipper, which goes all the way up to the stand-up collar. This is a hoodless jacket, suitable for layering or to be worn on its own in late autumn and dry weather. The fit is normal, with slightly loose sleeves, designed for comfort and easier movement. The colors available are: White, Black, Charcoal and Navy. Sol’s North fleece jacket is also made of anti-pilling fleece and weighs around 300g/m2. It comes with elastic cuffs, which also have drawstrings. The main zipper is integrated and the collar is medium-height and stand-up. There are two slanted zip pockets on the sides, with flaps on top and lined on the inside. It has flatlock seams on the back, sleeves and shoulders. The color selection includes many options: Black, Charcoal grey, Dark chocolate, Purple, Fir green, Orange, Red, Rope, Navy, Royal blue and Army green. 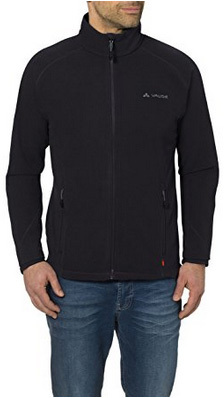 Smaland by Vaude comes in a slim fit design, with smooth outside and warm, breathable inside. 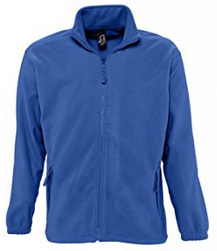 Suitable for sports and mild, dry weather, this jacket makes a great layering jacket also. It has two side pockets with zippers and a weather-resistant, integrated main zipper. It is hoodless, with a short, stand-up collar. The hem is adjustable with drawstrings, which can be accessed through the pockets for an easier adjustment. There are 5+ color options available: Cedar wood, Indian red, Cactus, Black, Marine, etc. 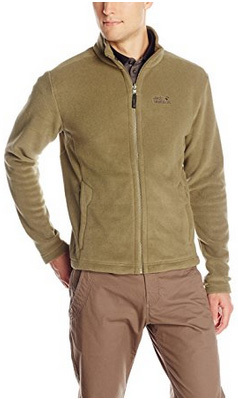 Jack Wolfskin‘s fleece jacket, Moonrise, is a normal fit jacket, in a casual design. It is suitable for early autumn and mild temperatures if worn on its own. It is hoodless, which makes it more appropriate for dry weather. There are two zip pockets on both sides, which function as hand-warmer pockets. 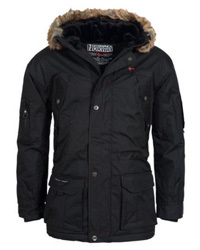 This jacket is suitable for layering, underneath a heavier jacket with a similar zipper system. It has a stand-up collar and comes in a wide range of colors, which include: Black, Chili, Burnt olive, Earth orange, Red fire, Night blue, Indian red, Moroccan blue, Classic blue and several shades of the Night blue color. 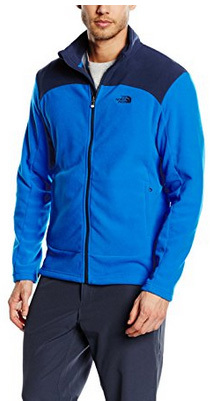 100 Glacier is a fleece jacket by one of the most featured brands in our reviews, The North Face. It goes without saying that this is a good quality jacket, designed for those who are active year-round, but suitable for those who simply enjoy a bit of flexibility in their clothing. This jacket is highly breathable, lightweight and fully insulated, which make it suitable to wear in any temperature as either on its own, during mild weather, or as a layering jacket in colder temperatures. 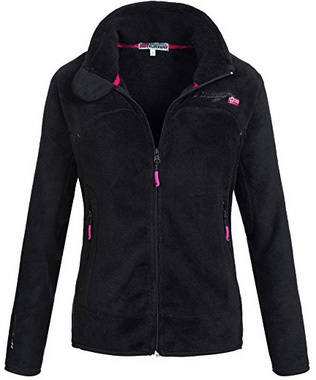 It is a normal fit and comes with two hand-warmer pockets on the sides, with zipper closures. Another feature of this jacket, is its UV protection factor of 30+. It is adjustable at the hem and comes in several colors: Fiery Red, Flashlight green, TNF light grey, TNF black, Laurel wreath green, Sullivan Green, Blue, Heron Blue, Cosmic Blue and Bomber blue. And lastly, on the men’s selection, it is Thor 3, by Regatta. It comes with an integrated zipper and two side pockets. The main collar is stand-up and medium-height. The cuffs are lined on the inside for added warmth and the whole material is anti-pilling. This is a normal fit jacket, which can be adjusted by the drawstrings around the hem. It comes in the colors: Dark navy, Classic red, Clay, Firebrick, Glowlight, Black, Royal, Seal grey, Bordeaux and Bottle green. 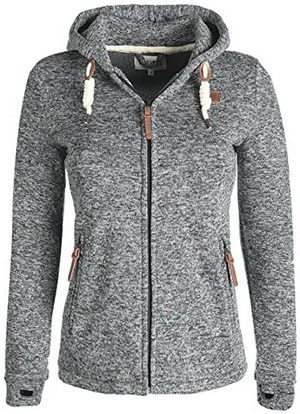 Moving onto the women’s selection, let’s begin with Bench‘s fleece jacket, which is thick and warm. It has a high stand-up collar, with an outer layer that can be adjusted with Velcro. The main zipper is 2-way and concealed, as are the zippers on the side pockets. The inner cuffs are long and come with thumbholes, which not only keep the hands warm but offer a better and more comfortable fit of the sleeves. It is a normal fit jacket, with a slightly enhanced waist and it is hip-length. The colors available include: Jet black, Pearl, Smoked Pearl, Blue, Sangria and Black. 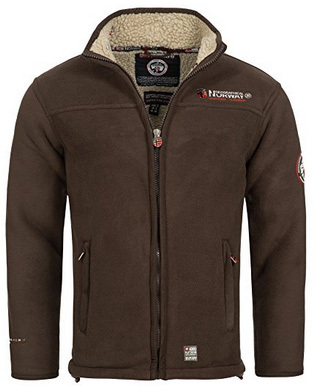 Next, we will continue with two fleece jackets by Geographical Norway. The first one is Ursula, a casual and sportive jacket, with a thickly lined stand-up collar. On both sides, there are two zipper pockets with enough room to carry small belongings and to warm up the hands. This is a loose fit jacket made of thick and soft fleece, which is breathable, insulated and warm, suitable to be worn as a layering jacket. It comes in the colors: Black, Turquoise, Brown, Grey, White, Navy and Pink. 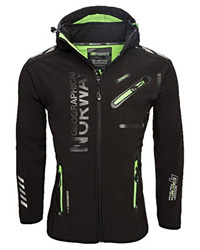 The second jacket is the Ge-No 21 model, which comes in an elegant design, highlighting the body shape and curves. It has an integrated zipper, with a back placket and slim cuffs on the sleeves. This is a lighter jacket than the previous one, with a short, stand-up collar. It is suitable as a transitioning jacket during mild temperatures and it is designed for both comfort and mobility. Due to its light weight and softness, it is quite easy to pack and carry it with you while travelling. The color options include: Light grey, Coral, Pink and Purple. 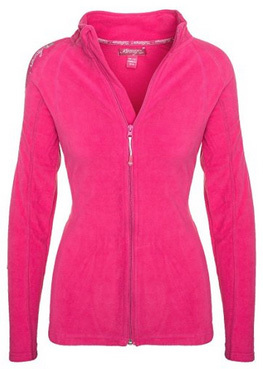 Marla by Ultrasport is made of micro fleece, with anti-pilling qualities. It comes with a Velcro-adjustable high collar and a 2-way main zipper. 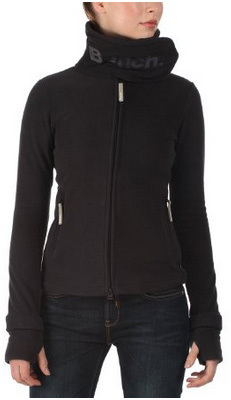 There are two zipper pockets on the sides, lined on the inside to warm up the hands quickly. The cuffs are long and come with thumbholes, to keep the hands warm. 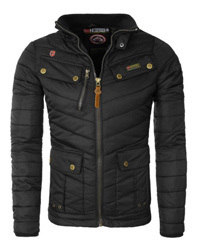 It is a normal fit jacket, with a slightly narrow silhouette and suitable for mild and cold temperatures in dry weather. It can be worn as either a warm jacket on a daily basis, or for outdoor activities, as it is quite easy to move around in. The colors available are: Black, Blue, Grey and Pink. Getting to the hooded fleece jackets, this next one by Casual Standard is made of 80% Cotton and 20% Polyester on the outside, with an inner lining made of teddy fleece. 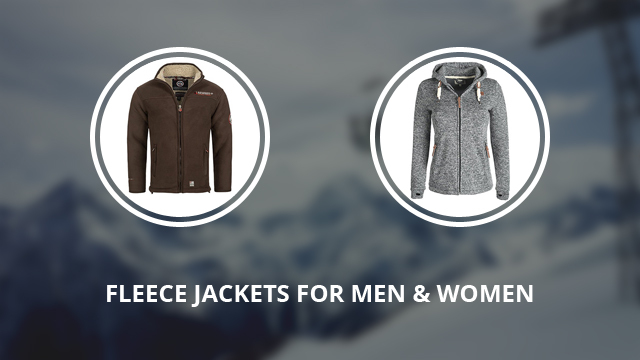 It is a warm and cozy jacket, which can be worn either at home or outdoors in mild weather. The hood is also lined with teddy fleece and it comes with drawcords for adjustment. The cuffs and the hem are slightly elastic and there are two slide pockets on the sides, which, when the jacket is zipped up, resemble a kangaroo-style pocket. 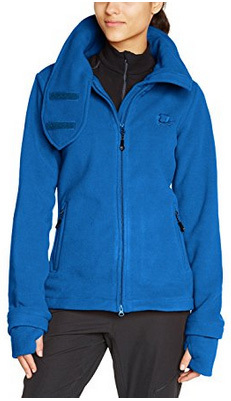 It comes in the color Blue, with the teddy fleece colored white. Thory is by DESIRES and it also comes with an adjustable hood. The cuffs are slightly long and have thumbholes in them. There are two zipper pockets on both sides of the jacket and it comes in a normal fit. This is a comfortable and breathable jacket, suitable for mild weather and with some elasticity to the fabric, for better movement while being active. 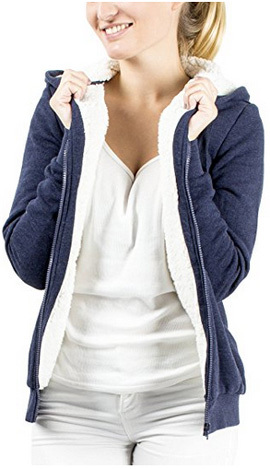 The design is made to resemble a knitted jacket, which suits the color selection perfectly as they are speckled with white, black and grey, apart from the main body color. These options are: Insignia blue, Black, Dark grey and Coffee bean. And lastly, we will be ending our selection with a long jacket, that will make you feel as if you are wearing a soft, warm blanket the whole time. 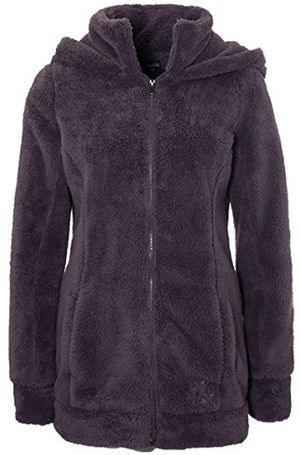 It is by Sublevel and it comes with teddy fleece in and out. It has a hood attached underneath the high collar and an integrated zipper. There are two side pockets and thick, fluffy cuffs, with thumbholes. This makes a great indoors and outdoors jacket. It is below hips in length and has a narrow silhouette, in a normal fit. It comes in the colors: Black, Grey and Light grey.